﻿ John 13:35 "By this all men will know that you are My disciples, if you have love for one another." "By this all men will know that you are My disciples, if you have love for one another." By this all people will know that you are My disciples, if you have love for one another." This is how everyone will know that you are my disciples, if you have love for one another." By this all men will know that ye are my disciples, if ye have love among each other. By this shall all [men] know that you are My disciples, if you love one another [if you keep on showing love among yourselves]. If you love one another, then everyone will know by [observing] this that you are my disciples." By this shall all men know that you are my disciples, if you have love one for another. By this it will be clear to all men that you are my disciples, if you have love one for another. 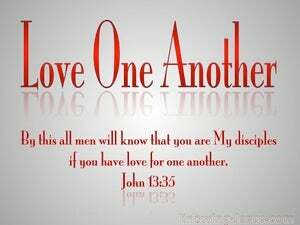 By this all men will know that you are my disciples, if you have love for one another." by this mutual love shall all men know that you are my disciples. By this shall all know that ye are disciples of mine, if ye have love amongst yourselves. in this shall all know that you are my disciples, if you may have divine love one with another. By this they will all know that you are my disciples? ?y your love for one another." By this shall everyone know that ye are my disciples, if ye have love one to another. In this all shall know that ye are disciples to me, if ye have love in one another. 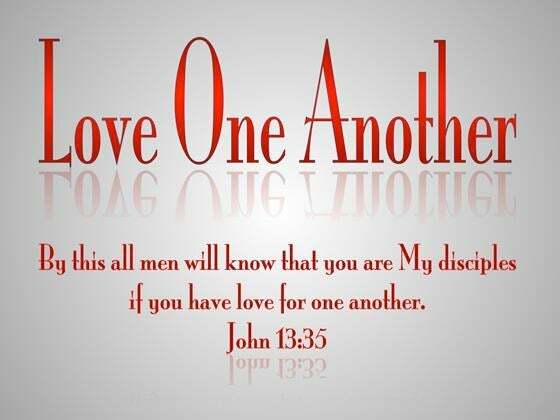 By this shall all men know that you are my disciples, if you have love one to another. By this everyone will know that you are my disciples--if you have love for one another." By this all shall know that you are My disciples, if you have love toward one another. By this shall all men know that ye are my disciples, if ye shall have love one to another." By this everyone will recognize that you are my disciples, if you have love one for another." 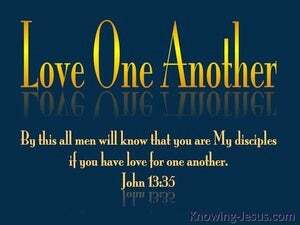 By this shall all men know that you are my disciples, if you have love one for another." Everyone will know by this that you are my disciples -- if you have love for one another." By this everyone will know that you are my disciples, if you have love for one another." By this will all men know that ye are my disciples, if ye have love one for another. By this shall all know that you are my disciples, if you have love one for another. By this, shall all men take knowledge, that, my disciples, ye are, - If ye have, love, one to another. It is by this that every one will recognize you as my disciples--by your loving one another." It is by this that every one will know that you are my disciples--if you love one another." By this everybody will know that you are my disciples, if you keep on showing love for one another." By this shall all know that ye are My disciples, if ye have love one to another." if ye have mutual love to each other. 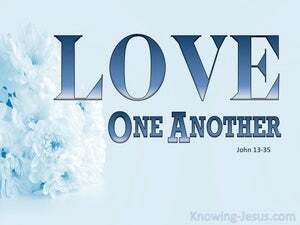 34 "A new commandment I give to you, that you love one another, even as I have loved you, that you also love one another. 35 "By this all men will know that you are My disciples, if you have love for one another." 36 Simon Peter said to Him, "Lord, where are You going?" Jesus answered, "Where I go, you cannot follow Me now; but you will follow later." If someone says, "I love God," and hates his brother, he is a liar; for the one who does not love his brother whom he has seen, cannot love God whom he has not seen. By this the children of God and the children of the devil are obvious: anyone who does not practice righteousness is not of God, nor the one who does not love his brother. that they may all be one; even as You, Father, are in Me and I in You, that they also may be in Us, so that the world may believe that You sent Me. And there was strife between the herdsmen of Abram's livestock and the herdsmen of Lot's livestock Now the Canaanite and the Perizzite were dwelling then in the land. And the congregation of those who believed were of one heart and soul; and not one of them claimed that anything belonging to him was his own, but all things were common property to them. At the hands of the apostles many signs and wonders were taking place among the people; and they were all with one accord in Solomon's portico. The one who loves his brother abides in the Light and there is no cause for stumbling in him.